It’s here! The final week of the One Room Challenge and the big reveal of my Artfully Fresh Foyer! A brief recap and then I’ll get right to it. For those just tuning in, I live in an old, old house — 226 years old to be exact. As I’ve decorated each room, I have gone for a historically-inspired, tradition-with-a-twist, “fresh classic” look. I want it to be comfortable and to reflect my family’s colorful character, as well as the spirit of the families that have come before us. I want others to find it charming, welcoming, and lovely. I love when art serves as the inspiration for a room, and I had found this beautiful painting that resonated with me deeply at auction (read more about scoring finds at auction here and here). The subtle coral highlights and brilliant turquoise in the painting’s sunset sky and served as my color launchpad. My vague inspiration board below. And here is the after! What do you think? The way my vintage French blue opaline lamp and the Thomas O’Brien Clark flush mounts talk to each other just kills me. 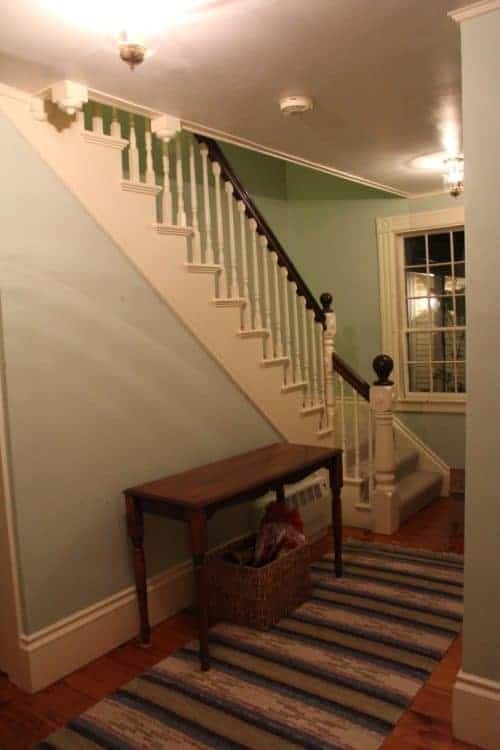 I wanted the ceiling fixtures to reflect the turn of the last century (See that Victorian banister? I told you, lots of families have lived here. ), but man, it’s like Thomas O’Brien actually found my lamp at the Paris Flea Market, made it in brass, and hung it up. The other view of the foyer. I really struggled with the placement of the painting — center it on the wall, or center it on this particular view so that the shade wouldn’t overlap it visually. I chose the former, thinking we’ll be happiest with that placement long-term. Of course, had I thought of it sooner, I could have moved it for this photo by using removable Command strips. Obviously, forethought was not my strong suit here. But honesty is! However, my biggest struggle in this project — at least at the outset — was color. 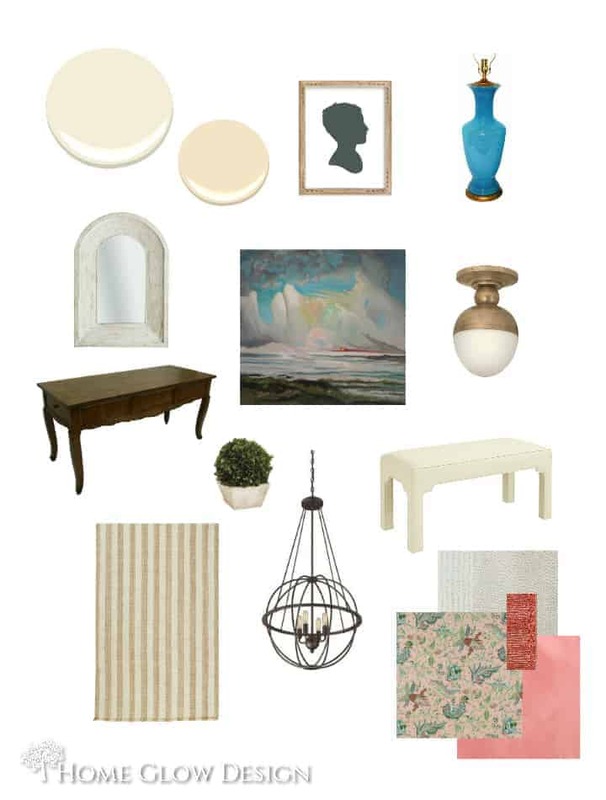 I wanted a pale, glowy coral, but also one that coordinated with the Ben Moore Linen White trim that is throughout most of the house (with a house as old as mine, you have to expect some hodge podge). I chose Ben Moore Pirate’s Cove Beach, and I LOVE it! It makes me so serenely happy. I swear, every time I go through the foyer I find myself stupidly smiling like the Cheshire Cat (which, now that I think of it, may conjure up images more of a psychotic smile as opposed to a serene one, but you get my drift). You can’t see much of it here, but this little pastel painting is by Karen Margulis, a wonderful plein air artist I found on Etsy. Depicting one of those dirt paths you can find by the mile in the wildlife refuges of Sanibel Island, one of our favorite places, the painting was a birthday gift to my handsome husband a couple of years ago. The silver plated green enamel bowl is a memento of antiquing in Boston during a singing gig with Emmanuel Church’s Bach Institute. Nothing beats a handmade lamp shade to really “top” off a lamp. Could you imagine this blue lamp in a plain old ivory one? This shade is in two colors of Duralee silk. If you want to know who made it, you have to come back for my usual Saturday blog post, hehehehehe! lamp shade fabric 1 & 2 / maker to be revealed Saturday! Another question of mine was whether to do a regular lining on the relaxed Roman shade, which would allow the light to shine through, or use a blackout lining, which would show the pattern more solidly. As this isn’t a bedroom, I didn’t care about the need for dark. The fabric is so cool, I almost went blackout, but the desire for airy and glowy won in the end. Here you get an idea of the fabric pattern — a fun but subtle pattern in neutral — and loads of light. I love this little watercolor of two figures on horseback, another auction find. I nabbed it — only $25 — because it reminded me of my stint as a wrangler in Colorado. Yes, I used to be adventurous. Silhouettes of Things 1 and 2 look perfect going up the stairs. Tradition with a twist. Crazy cat, smiling ear to ear. This lantern from Wayfair was just the thing to fill up the enormous void of space I had. I don’t think just a round, 20″ lantern would have done the trick half as well. I put in Edison LED light bulbs I found at Lowe’s. In retrospect, I wish I’d hung the lantern a bit lower, but we didn’t have the silhouettes yet, so I didn’t know exactly how high they would hang. 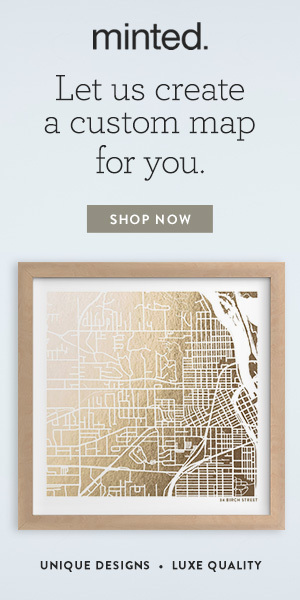 Minted’s custom map of our village — you can see it’s still pretty sparce around here, though the old-timers will say there’s been a population explosion — and an old photo of our house from the 1850s (wish the porch were still here!) that I found at the town historical society. The star on the map marks the spot! And there you have it! A big thank you to my sponsors, Benjamin Moore, Aubuchon Hardware, and Minted. Head back over to the One Room Challenge to see all the rest of the participants. I hope some of you new readers will stick around and come back to visit me each week on Home Glow’s Saturday Blog! Make it easy on yourself and sign up for each post to be delivered to your inbox on the right sidebar of this page. A little teaser for you — Did you like that coral silk lamp shade? Have you been lusting after the bespoke look of Blanche Field or Irving and Morrison lampshades, but worried you’ll have to give up your firstborn to afford one? This Saturday I have a couple of fantastic sources for handmade *heirloom* lampshades that are available to consumers — at about 1/2 — 1/3 the cost of the above two vendors. But you gotta come back to find out! P.S. I’m out of rooms to decorate in my house for at least 2-5 years (says the bank account and the handsome husband), so if you’re local-ish and would like to jump in on this ORC madness for the spring round, give me a shout and we can discuss. Hey, it gets it done! Love this reveal Amy! The fabric on the bench, the gorgeous opaline lamp with the fabulous shade (can NOT wait to hear the source!) … be still my heart! The stair runner is great. I’m looking at doing a runner due to 3 dogs;) I’ve looked into ordering one of the I & M lampshades, but just couldn’t bring myself to do it! Can’t wait till Sat! !